There is no exact time during an infant or child's life to experience the cycle of teething. In some cases, newborns may actually have one or two teeth. In other cases, teething can start as late as one year of age. The average age is somewhere between 4 and 7 month. However, should your baby be younger than 4 months and exhibit the signs of teething, it is still quite normal. Every child (just as every adult) has a unique personality. Therefore from infant to infant and child to child, teething systems may differ but the symptoms are relatively similar. Babies start to act fussy and frequently wake up during the night crying. Generally there will be a bump on the infant's gum line. In some cases, the gum will remain as it is until the first tooth pops through. During this phase, babies will attempt to chew whatever they can grab and put into their mouth. Babies will also drool and portray red irritations around their mouth and cheeks so it is important to gently wipe away the saliva to prevent or at least reduce the irritation. Ear pulling and a slight fever also occur at this time, generally results of the teething pain which also (just as in adults) is a side effect of pain in that area of the head. (Just in case, make sure it's not an ear infection or a fever due to illness by seeing your doctor. Babies will occasionally have loose stools or diarrhea and the theory is that it's from swallowing extra saliva. However, you should monitor this carefully in the event that's a real tummy problem - not a tooth problem, and see your physician. The most important thing for you to remember is that teething is the most natural event even though it causes your baby to be uncomfortable. The goal is to keep your baby as comfortable as possible. There are many safe, easy and natural remedies that will alleviate the discomfort of teething, including both physical pain and emotional distress. Amber Teething Necklaces handmade of Natural Baltic Amber have become increasingly popular. Containing Succinic Acid, a naturally occurring substance, Amber is believed by some to be a natural pain reliever, anti-inflammatory, and calming to the nervous system when worn against the skin. 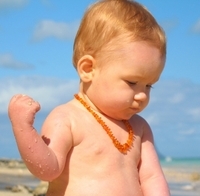 Please supervise your child at all times while wearing the Baltic Amber Teething Necklace. Amber Teething Necklaces are made for wearing not for chewing! Amber will crack and break under too much pressure. Teething Jewelry should be removed when child is sleeping or unattended!